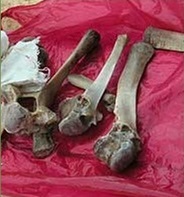 Osteomancy is divination using bones. It is one of the oldest forms of divination and spreads across many cultures. In one method, the bones are thrown and the resultant shapes are interpreted. Under another, the bones are shaped or marked (like dice) and thrown. The results are then interpreted. Another form is pyro-osteomancy when the seer predicts the future based on the cracks in an animal bone - often the shoulder blade (scapula) after it has been burned in a fire. This practice is most often associated with the Chinese. The earliest pyro-osteomancy in China included the bones of sheep, deer, cattle, pigs and turtle shells. However, pyro-osteomancy was widespread. It is also known from prehistoric east and northeast Asia, and from North American and Eurasian ethnographic reports. Mumbo-jumbo-meter: 10/10, possibly even 11/10.